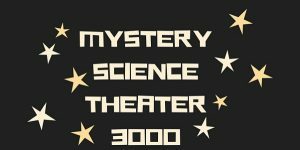 Mystery Science Theater 3000 on Hoopla! This year marks the 30th anniversary of the debut of Mystery Science Theater 3000. If you've never heard of Mystery Science Theater 3000, you can stop reading now. Just kidding, you'll want to read about this. Once upon a time, an amiable guy was kidnapped by mad scientists. The mad scientists launched him into space. They made him live on a satellite and watch not-so-good movies. The amiable guy triumphed (sort of) by creating robot companions who joined him in the theater to watch and mock those not-so-good movies. That's the premise of the show Mystery Science Theater 3000. Last year, after an 18-year-long absence, a new season of Mystery Science Theater 3000 became available. You don't have to pay anything to watch selected episodes of Mystery Science Theater 3000. You can watch episodes from the 1990's as well as all 14 episodes that were released in 2017! They're available for free with your library card when you use St. Tammany Parish Library's Hoopla service! to create your free Hoopla account. If you need help creating your Hoopla account, call a reference librarian. Also on Hoopla, original, uncut, preMSTed movies, and a handful of movies riffed by the folks at RiffTrax! (MST3K alums Bill Corbett, Kevin Murphy, and Michael J. Nelson). To find episodes of Mystery Science Theater 3000 and RiffTrax!, search Hoopla itself, rather than the library's online catalog. For all you MSTies (and soon-to-be MSTies) out there, "It's Movie Sign!"